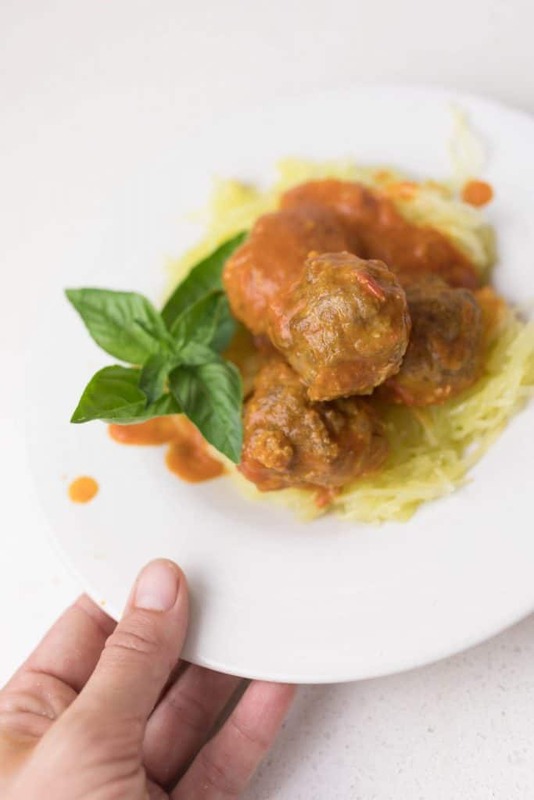 Pumpkin Chipotle Spaghetti Squash with Homemade Meatballs is hearty, healthy and made with seasonally fresh winter squash- the perfect meal for the cooler months ahead! This post is sponsored by ALDI. All opinions are my own. The leaves are changing and the temps are starting to actually cool down a bit here in the Midwest. It’s around this time of year that I grab no less than 10-15 squash every time I go to the grocery store. They are simple to prepare, filling and perfect for autumn soups and stews. Next to some organic grass fed beef they make a filling meal for our family of seven. Spaghetti, butternut, acorn and pumpkin- no winter squash is safe from me! Cooler days beg for the heartier meals that they lend themselves to so well. ALDI is my go to store for seasonal flavors- pumpkin, apple and maple. Their shelves are currently stocked with all things fall. Shopping at ALDI is fast and easy. I bring my laundry baskets along to load up all my groceries, and I’m in and out in less than 30 minutes. We have been to ALDI so many times, I don’t even need a list. I love that there aren’t a million options for every single product. They have just what I need. I don’t know if your local store has carts with two toddler seats, but the moment our ALDI brought those in, I knew they had officially won me over. They also have high quality organic options for everything I like to buy. ALDI is my one stop shop. For this recipe I use the Specially Selected Pumpkin Chipotle Sauce. Sometimes I cook my own pasta sauce, but when I don’t have time to make it myself, I’m pretty picky about the ingredients. A lot of sauces have GMO canola oil and non-organic sugar. Sometimes I even see High Fructose Corn Syrup on the list. As an avid label reader, ALDI pasta sauces pass the test for me time and time again. Also, they are in glass jars, so I don’t have to worry about BPA and other chemicals found in plastic. 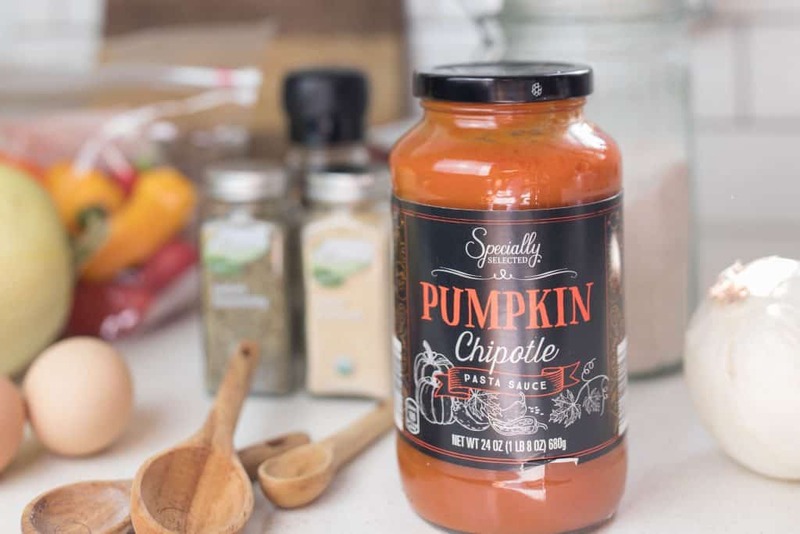 The Specially Selected Pumpkin Chipotle Sauce puts a new spin on traditional fall flavors, incorporating pumpkin with a little spice. Squash on squash…that’s my kind of fall meal. 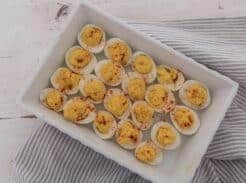 My kids love this dish so much. 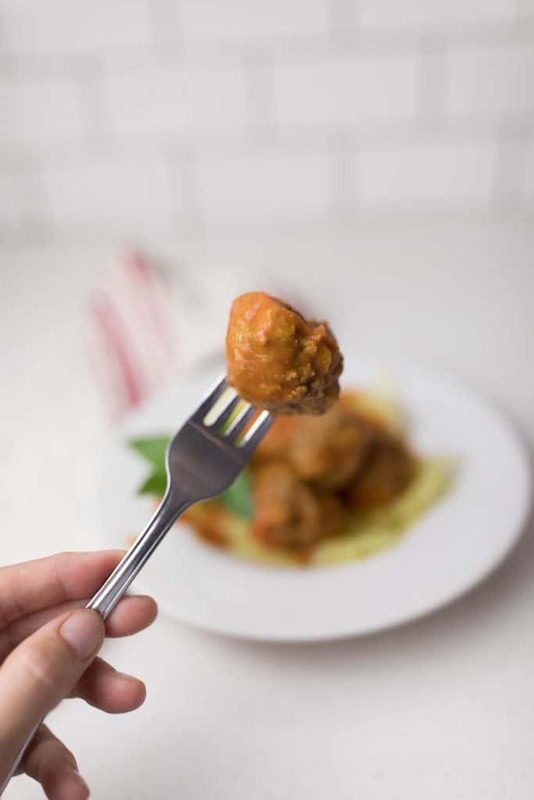 I had little hands coming to steal pumpkin pasta sauce covered meatballs before I was even done photographing them. This recipe is a sneaky way to get your kids to eat their veggies. 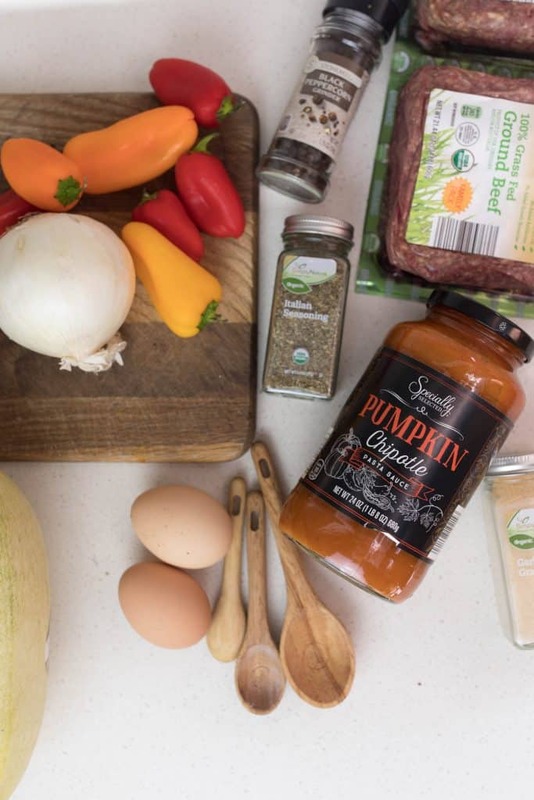 Specially Selected Pumpkin Chipotle Pasta Sauce- I love that the ingredients in this sauce are so minimal. There is nothing on the back that I can’t pronounce. It’s mostly just good old fashioned vegetables and spices. SimplyNature Spices- These are my go-to spices. They are inexpensive and organic. As a family who cooks almost everything from scratch, we go through A LOT of spices. The quality and price are important to me. SimplyNature Organic Grass-fed Ground Beef- If you could even see how much of this stuff I have purchased in the last two years! With five hungry kids, we are no longer a one pound of beef family. I can make our meat budget stretch reeaally far with this brand. Organic Mini Peppers- Peppers are on the dirty dozen list, which means they should never be consumed if not organic. The mini organic peppers from ALDI are sweet and crunchy. 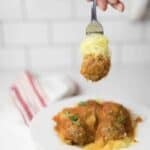 They add a lot of flavor to my homemade meatballs. 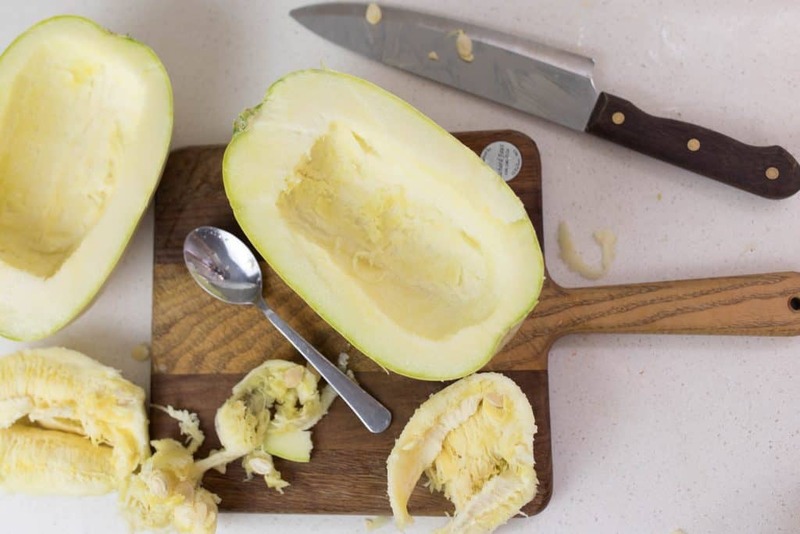 Cut a large spaghetti squash in half lengthwise. Scoop the seeds out of the middle. 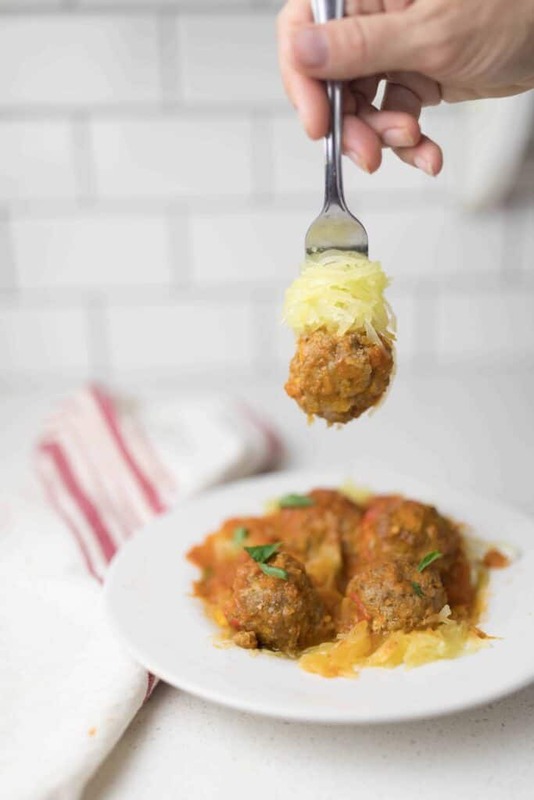 Place the spaghetti squash halves face down in a 9 by 13 glass dish. Bake at 350 degrees for 45 minutes, or until soft. 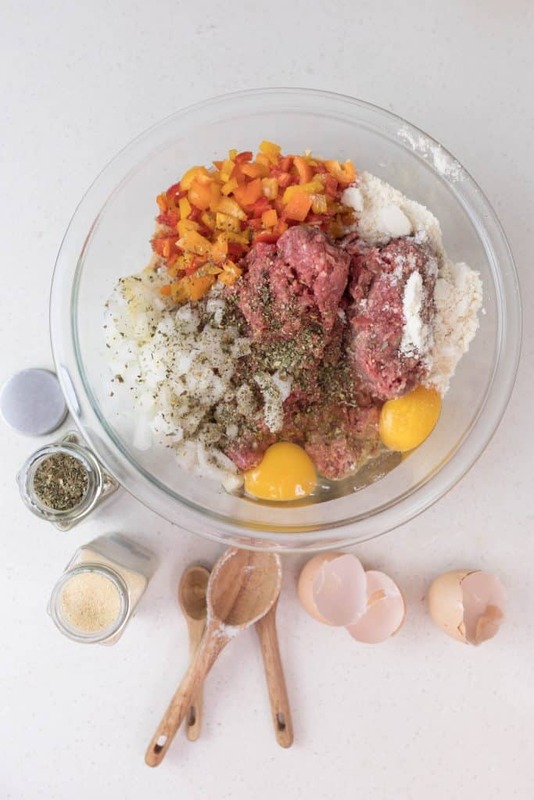 Combine the ground beef, eggs, Italian seasoning, garlic powder, black pepper, diced onion, diced peppers and coconut flour in a large bowl. 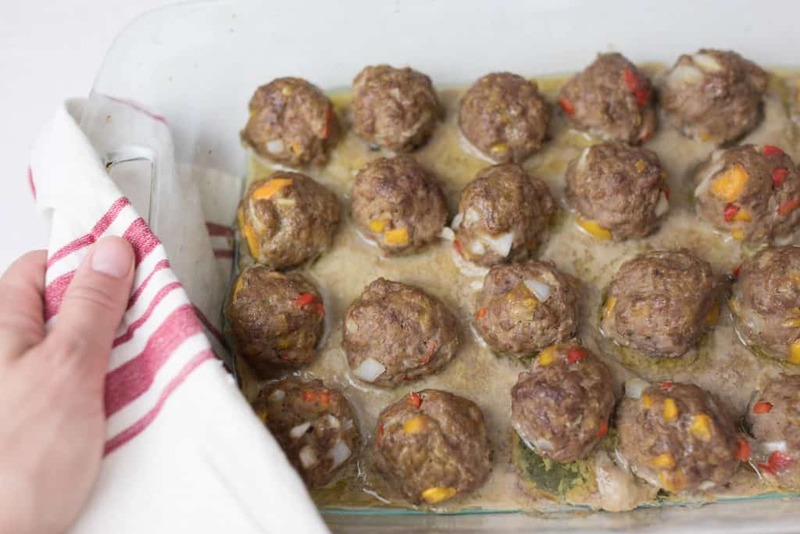 Roll the meat mixture into balls, approximately 2″ thick. Line the meatballs up in a 9 by 13 glass dish. 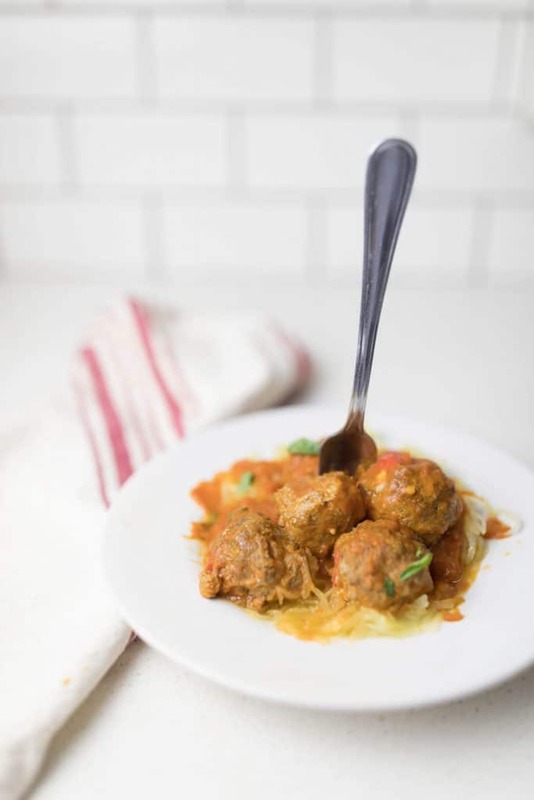 Add the cooked meatballs and two jars of Specially Selected Pumpkin Chipotle Sauce to a large saucepan. Simmer on medium heat for an additional 15 minutes, while you’re waiting for the spaghetti squash to cook through. I actually ended up doing one jar of Specially Selected Pumpkin Chipotle Sauce and one jar of Specially Selected Pumpkin and Butternut Squash Pasta Sauce. I wasn’t sure if my kids would complain of the chipotle being spicy. No one complained with the half and half ratio. In fact, they all lapped it right up! Add the squash back to the glass dish and toss it with the two tablespoons of 2 tablespoons SimplyNature Organic Mediterranean Extra Virgin Olive Oil and sprinkle with salt. 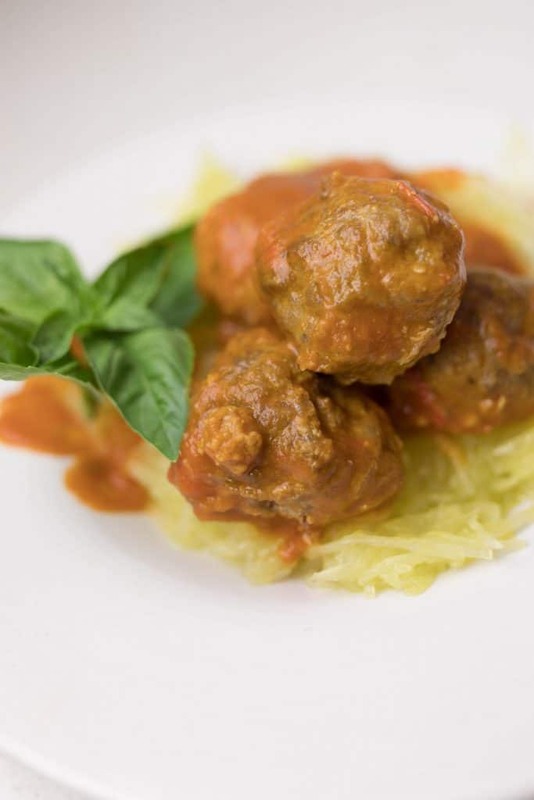 Add cooked spaghetti squash to a plate and top with pumpkin chipotle meatballs. I grabbed a little fresh basil from the garden to add an extra little something something. I can promise you one thing this fall. 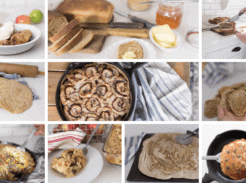 We will be making this recipe again and again and again. The kids loved it, a massive amount of veggies were consumed and it was simple to make. Need I say more? 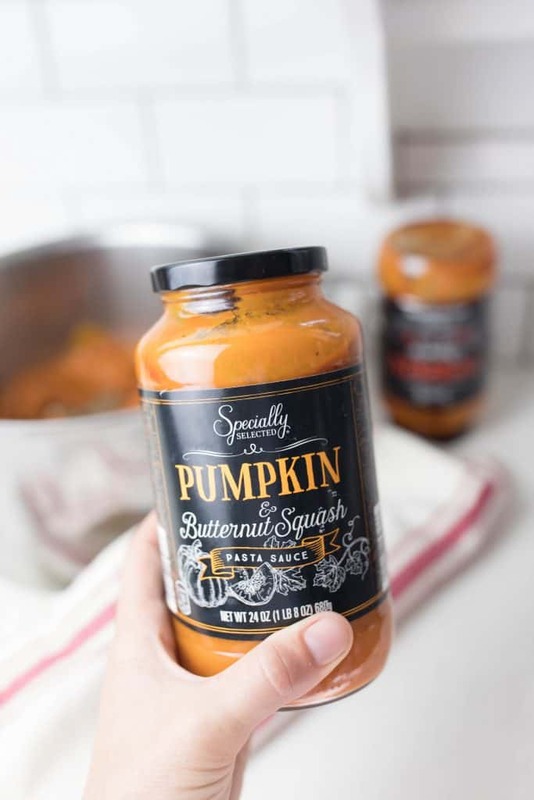 Make sure to head to your local ALDI store to pick up a spaghetti squash, Simply Nature Spices and Specially Selected Pumpkin Chipotle Pasta Sauce to make this delicious autumn dish! 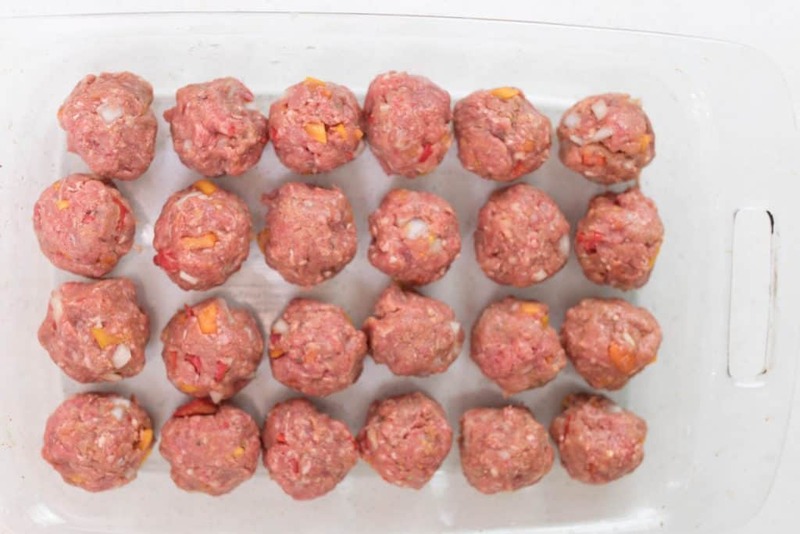 Roll the meat mixture into balls, approximately 2" thick. 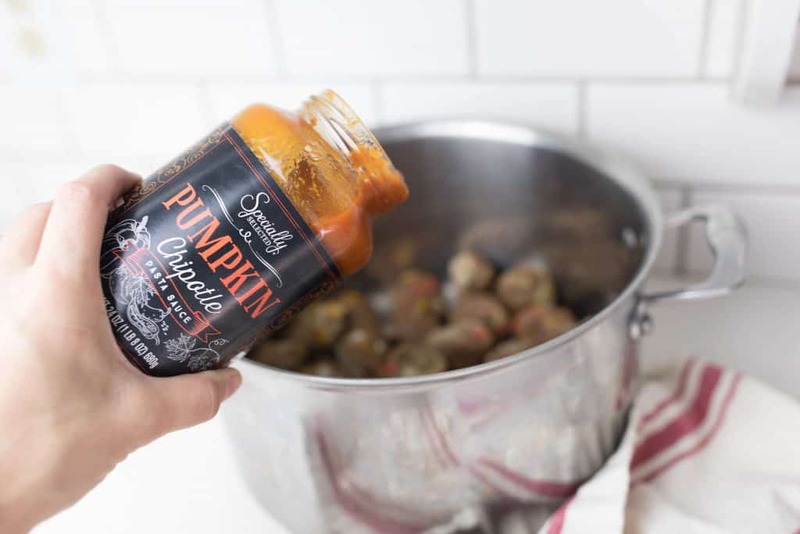 Add the cooked meatballs and two jars of Specially Selected Pumpkin Chipotle Sauce to a large saucepan. Simmer on medium heat for an additional 15 minutes, while you're waiting for the spaghetti squash to cook through. 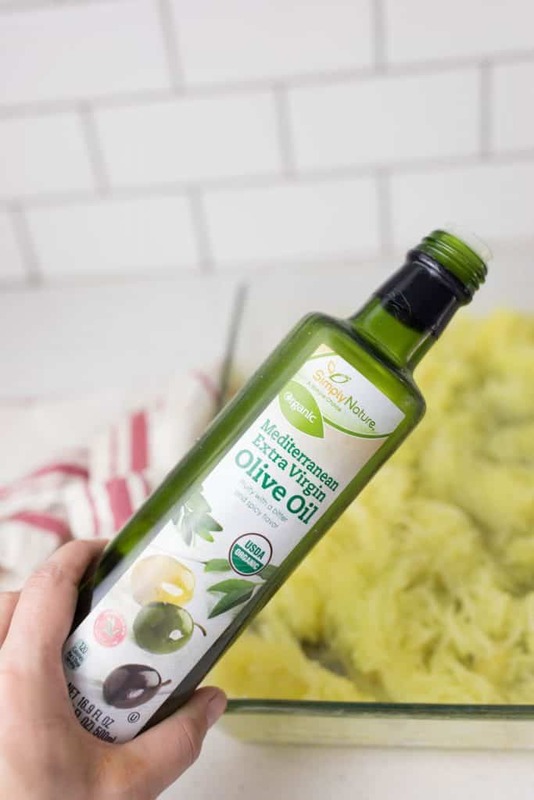 When the spaghetti squash is cooked through, scoop the squash from the peel and add it back to the glass dish and toss it with the two tablespoons of 2 tablespoons Simply Nature Mediterranean Extra Virgin Olive Oil and sprinkle with salt. I actually ended up doing one jar of Specially Selected Pumpkin Chipotle Sauce and one jar of Specially Selected Pumpkin and Butternut Squash Pasta Sauce. I wasn't sure if my kids would complain of all chipotle being spicy. No one complained with the half and half ration. In fact, they all lapped it right up! I grabbed a little fresh basil from the garden to add an extra little something something. I prepared this exact meal on Monday for dinner !!! The only difference is I didn’t include the sweet peppers and I add some water to the dish when I bake the squash. It keeps the squash from drying out while baking. Like you, I’m a regular at the Aldi near our house. 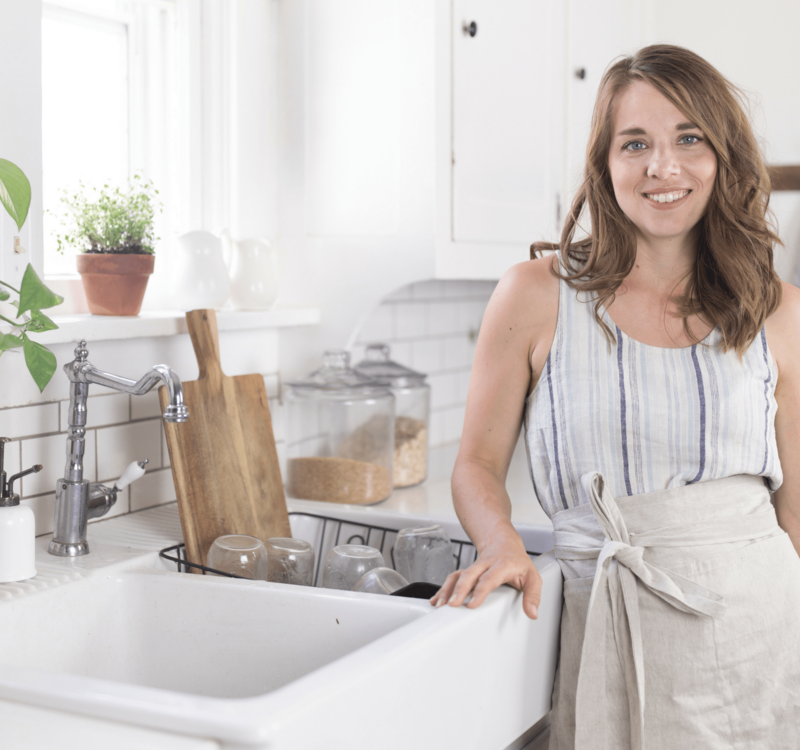 I love that I can be in and out quickly, feed my family wholesome organic food and save money at the same time. That’s a win, win, win for this busy mom. Was able to grab the last jar of Pumpkin Chipotle at my Aldi’s! Made this tonight and my husband, who hates all things pumpkin, liked it. It was delicious. Thanks for sharing! I don’t enjoy your posts as much with all the references to your sponsor and recipes made from ready made sauces only sold at your particular sponsored store. Sorry this bothers you, but we really love this sauce. I used it last fall too. Its delicious and meets my natural standards, with the tiny ingredient list. I genuinely love ALDI! I understand! 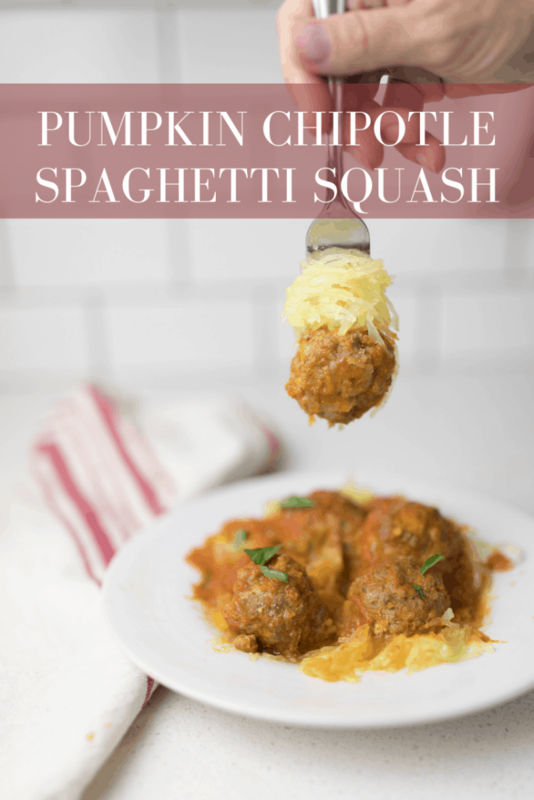 If you are able to come up with a way to make the chipotle squash sauce from scratch, I’d love your recipe. We don’t have any ALDI’s or that sauce at store near us. Keep up the fantastic posts! I think your blog is awesome. I’m sure this could definitely be made from scratch. Sometimes you just need something easy. 😉 Thank you so much! 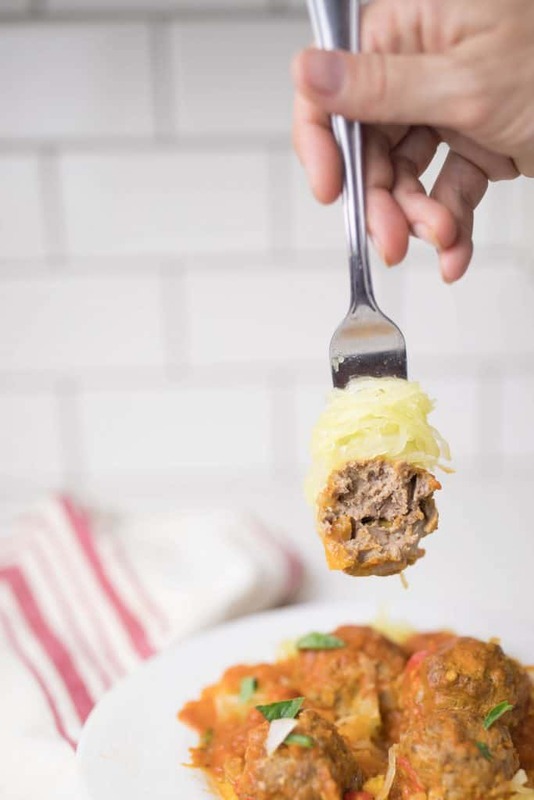 We made the meat balls from this post. They were fantastic! We added mushrooms and used ground oats instead of coconut flour only bc I didn’t have any coconut flour. 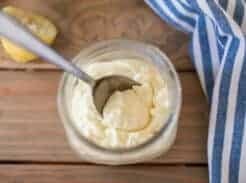 We substituted a vegan “Alfredo” sauce made with nutritional yeast and white beans. Your recipe was fantastic and 2 pounds of beef disappeared without a trace. Delicious. Very delicious. I also opted for oat flour and it was very good. I served it with your cornbread recipe and a simple side salad. I don’t have an Aldi’s here, but Trader Joe’s has an Autumn sauce that i think would work great with this recipe.